Nola to Angola raises money to support prisoners and their families and also aims to highlight the daily struggles these people face. This weekend, 50 bikers will, yet again, make a trek 170 miles from New Orleans to Angola Prison in St. Francisville as part of the 5th annual Nola to Angola solidarity bike ride. The group arrives at the prison sweaty, unshowered and drained — a physical metaphor for the emotional journey thousands of Louisiana family members make each year to visit their incarcerated loved ones. Nola to Angola raises money for the Cornerstone Bus Project, an organization that sends free buses to various prisons throughout Louisiana that allow family members to keep in contact with the people society has discarded behind bars. Recently, New Orleans-based organizations FFLIC, VOTE and BreakOut participated in a report on the true cost of incarceration for families. The organizations’research highlighted the plight of those who are the unintended victims of mass incarceration, the same people who Cornerstone serves. 48% of families surveyed could not afford the costs associated with a conviction — for instance, direct costs such as bail and court fees, as well as indirect expenses, like exorbitant phone costs and transportation for visitation. Families end up paying the price: debt, unstable housing, inadequate food, and lifelong negative health impacts. 83% of the family members primarily responsible for bearing these costs are women. These impacts are even more severe in Louisiana, the prison capital of the world. People participate in Nola to Angola because they like to bike, they want to see Louisiana, and it’s a fun and structured bike ride. But more importantly, the ride makes the struggle so many families go through more visible to the community. Each Nola to Angola rider is tasked with raising $250, all of which goes directly to the Cornerstone Bus Project. 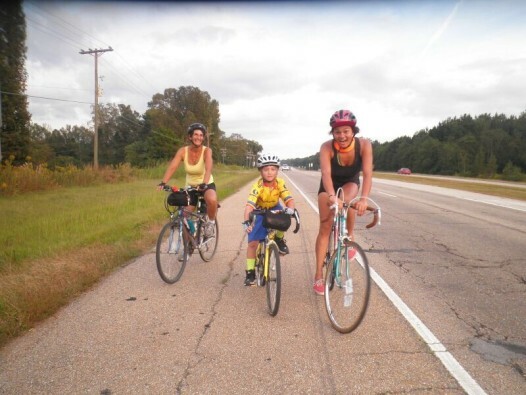 Riders reach out to their families and networks not only to raise money but also to raise awareness about the prison system and its impact on communities throughout Louisiana. Each year, with the support of Nola to Angola proceeds, Cornerstone has been able to expand the number of buses they send. Every bus that is sent means 50 additional people who have been able to visit their loved ones, and 50 incarcerated people who have had the opportunity to reconnect to their life outside of prison. The ride is from October 16-18. Registration is $50, and each rider is responsible for raising $250 in donations prior to the start of the ride. Nola to Angola provides meals, water, camp sites, first aid and bike repair supplies to all riders. Cyclists are responsible for bringing their own helmets, sleeping bags, snacks and water bottles. Cyclists of all levels who are not registered are invited to support by biking out of town with the group during the send off at 8 a.m. at Tulane and Broad, on Friday, October 16. Donations can be made here.